Those overlapping teams ("SMON") are Saint Mary's and Concordia. And to answer Neate's question from last week...no. But they're really close. 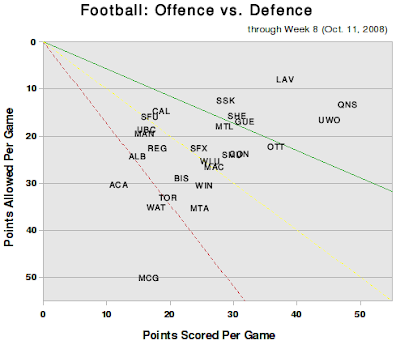 Check out those CanWest teams (save for Saskatchewan): none of them have given up nor scored a lot of points. I guess not having any also-rans in the conference helps keep the good teams from running away with the title, but scoring is really down out west this year. It's up in Ontario, though that's probably all because of York. Speaking of the Lions, they were dropped from the chart this week, because what's the point? McGill's on there, but barely. And does anyone want to offer odds on the Gaels (at Waterloo on Saturday) not going 8-0?